Can we order small lots? Find the answers to this questions and more in our introductory video! "To provide high quality and high performance 'Made in Japan' products to the world." Over the 93 years since our company was founded in 1921, we have sold industrial equipment and products for all kinds of industries here in Japan. We deal with a wide range of essential products for manufacturing plants, including hoses and all types of hose fittings, drive belts, conveyor belts, chains, pulleys, sprockets, finished goods and molded goods made from rubber or plastic, sheets, seal materials, gaskets, filters, bearings, machinery, and tools. Our company has accumulated a great deal of experience in customer service and know-how over our 93-year history in Japan. We deal directly with over 50 manufacturers, so we can provide your company with valuable information and a prompt estimate. We can provide with information you need relating to food factories, automobile factories, integrated circuit related parts factories, shipyards, agriculture, public works, construction, etc., and we can meet the needs of a variety of industries. If you contact us, we will offer you high quality "Made in Japan" industrial products with prompt, courteous, and devoted service. Our company is seeking business partners around the world with whom we can conduct regular business. Mitsuboshi Belting Ltd., Togawa Rubber Co. Ltd., Tigers Polymer Corporation, Togawa Industry Corporation, Kanaflex Corporation Co. Ltd., Totaku Industries Inc., Chukoh Chemical Industries Ltd., Hagihara Industries Inc., Kuraray Plastics Co. Ltd., TOYOX Co. Ltd., Japan Matex Co. Ltd., Nabeya Bi-tech Kaisha, Habasit Nippon, Yokohama Rubber Co. Ltd., Bridgestone, Hitachi Metals Techno Ltd., and more. 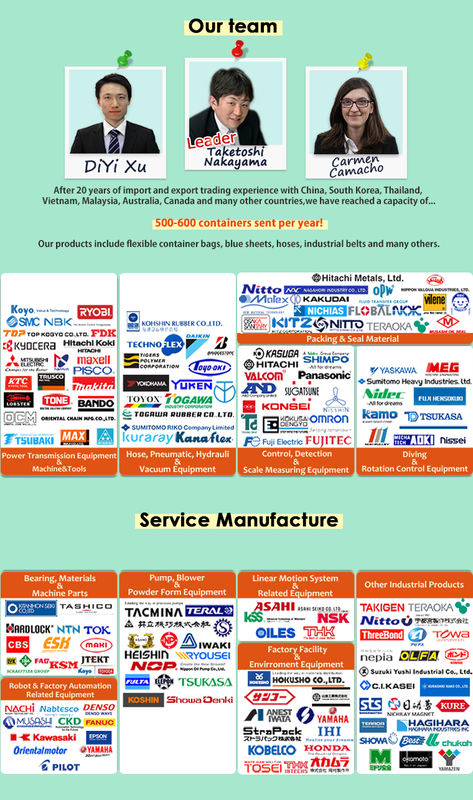 We do business with so many manufacturers that there is not enough space to list them all here. In addition, we also specialize in one-of-a-kind piece rubber and plastic finished goods that manufacturers cannot make. If we have the blueprints, we can give provide an estimate for OEM production of the product with Japanese quality.